I have a little personal conjecture about how Incineroar was designed. 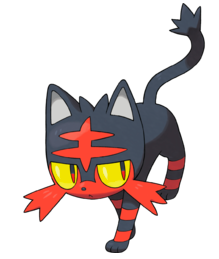 Game Freak deeply, sincerely, earnestly didn’t mean to make a fourth Fire/Fighting starter Pokémon. They were just going to sit down and come up with some unique, entertaining and vaguely Hawaiian-inspired Fire-type. But then Incineroar just rose up, unbidden, out of the primal mists of Game Freak’s collective id, embedded himself in their tortured psyches, and refused to leave. Aware that they were making another Fire/Fighting starter Pokémon, but horrified by their inability to stop, they desperately called on Yveltal for help, and the vicious and cunning death god answered their prayers by corrupting Incineroar into a brutal Dark-type. 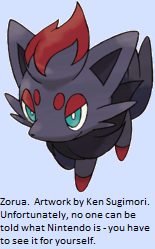 I should probably begin this entry with a disclaimer: for various reasons, I don’t actually have a Zorua or a Zoroark. In theory I know everything about them I need to know to write the entry, but their powers are rather complicated, as I’ll explain later, and I’m not sure I can really do justice to their impacts on the flow of battle. Then again, I’ll probably just do exactly the same thing as I always do: stare at their numbers for a while, research what everyone else says about them on the internet and then make dozens of wildly unsubstantiated assertions laced with bizarre and confusing metaphors before declaring victory and passing out on the sofa. What, you mean you didn’t know? Remember Dragonite? I liked Dragonite; Dragonite was nice and enjoyed helping people. Not all Dragon Pokémon are nice, of course; Flygon, Haxorus and Altaria are, but Kingdra and Druddigon are basically crazy old men shouting at the kids to get off their lawns, Garchomp is ill-tempered though not malicious, and Salamence is just slightly insane and prone to extremes of anger and joy. Hydreigon, on the other hand, is utterly, completely, irredeemably, certifiably, three-eggs-short-of-an-Exeggcute WHACKO. There’s gross… and then there’s gross. By which I mean, some things are disgusting and others are just nasty. On the one hand, you have Pokémon like Muk, who is literally made of toxic waste, Weezing, who can cause lung cancer at fifty paces, Gloom, who is constantly surrounded by the stench of rotting meat, and Lickitung, who… well, I think we can all agree; the less said about Lickitung, the better. On the other hand, you have Pokémon that wear their own cast-off skin as trousers and hoodies. I could go either way on this one, really. Let’s see. Today I’ll be talking about the desert crocodile Pokémon, Sandile, Krokorok and Krookodile. They are… well… crocodiles that live in the desert. That’s a good start, but it does seem to me like the designers have been reusing a formula again – and I’m not talking about the older crocodile Pokémon, Totodile, Croconaw and Feraligatr. What Game Freak have done is take a North African river animal, shift it a few hundred kilometres west, turn it into a Ground-type with a wave of their magic wand and said “eh; good enough.” Sound familiar?